The Nissan e-NV200, with 4,319 sales in 2016 (up 7%), has become the best-selling electric van for Europe. The plug-in Nissan utility offering is currently available in 17 countries. Depending on version, the e-NV200 (24 kWh only) is rated at 163-170 km in NEDC (101-106 miles) on a single charge, but in real world one should expect around 75 miles/120 km at best. Available versions of the plug-in NV200 come in both commercial van trims and fully optioned Combi / Evalia passenger variants (five-seat and seven-seat). 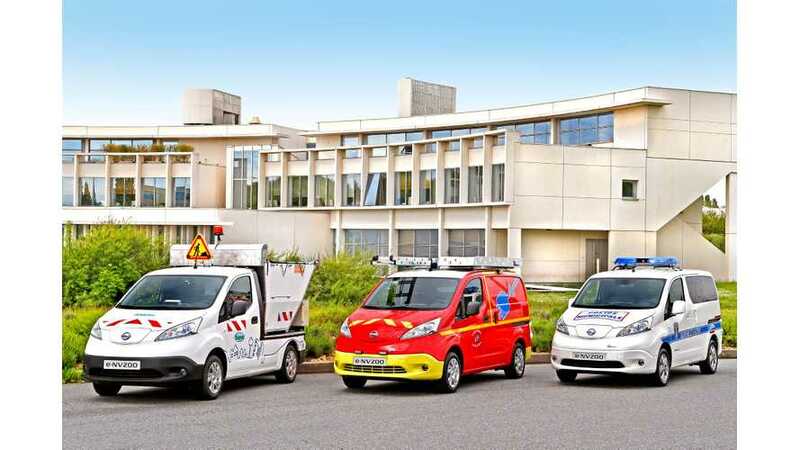 We expect for 2017 that the newly improved Renault Kangoo ZE (with 50% more range via a 33 kWh battery - details) that logged ~3,900 sales in Europe in 2016 will quickly wrestle the top-selling all-electric crown from the Nissan...that is of course unless Nissan decids to shoehorn the 30 kWh LEAF battery (or something larger) into the e-NV200. “As more and more businesses focus on reducing their carbon footprint, the need to find zero emission transport solutions is becoming more important than ever. Through Nissan Intelligent Mobility, we are working towards a sustainable future and our e-NV200 complements our vision perfectly whilst catering to a wide range of customer needs.